Your space station idea should also work, although you will need separate stations for commercial and military. To "unburn" something you first make a snapshot of an object. Meaning you record the position of every atom composing it (maybe something like a 3D topology map). After burning the object you collect all the dispersed particles and reassemble it again, using the previously made record. You'd probably want to use nanomachines for this task, because you ain't gonna be happy doing this by hand. The point being as long as you understand a process you can - with sufficiently developed technology backing you - undo it. And this is slowly going off topic. Well yes, that's the point, maybe noone knows how to destabilise the jump point. Please read the argument in question guys. Idon't know why this point has turned into "maybe it could theoretically somehowbe possible" when the point is about whether it should be doable ingame. It is possible for something to be theoretically possible with certain knowledge but not actually practically achievable. 2. It's also possible for some things to be impossible and irreversible. As far as we know to this point, reversing entropy is physically impossible. It's quite a bold claim that you are sure that it is possible to reverse the heat-death of the universe because if humanity somehow lasted long enough, that would become quite a pressing concern. It's simply not true to say that just because we understand and can apply something in one direction, that we necessarily can do it in reverse. But yes, this is somewhat off topic I think. My point boils down to, just ebcause we know how to stabilise a wormhole ingame, doesn't inherently mean we know how to destabilise it again. Those are two different processes and the current system makes some sense in that regard. No. The point was that if we can do a process, we can undo it. Specifically it was in reference to the idea that "jumpgates" represent stabilised wormholes. So "building a new one" isn't applicable. You could make a new unstabilised wormhole, perhaps, but that doesn't get rid of the old one. The analogy was that just because we can burn something (stabilise the wormhole) doesn't mean we can reverse the process and unburn it (destabilise it again). So talking about "making a new one" is not only missing the point of reversing the process, your whole argument is in the wrong direction and you're suggesting rebuilding something that was never destroyed within the hypothetical. Can you think of any other system in which it is easier to remove entropy than add it? If transitable jump points are more stable than untransitable jump points, they would end up that way naturally. Nature tends towards stability, and it's had 13.7 billion years to work on it. This has nothing to do with entropy. If it weren't for the "13.7 billion years" it'd almost sound like something that came out of a creationist textbook. "Stability" is a human construct defined by human viewpoints. The universe doesn't care about your perception of stability and entropy is a thermodynamic principle. A star can be as "stable" as you like, it will eventually become unstable and then cease to be a star. Ultimately entropy will create a state of supreme "stability" but that has little to do with the life cycles of objects or their stability as percieved by a human being. I don't think everyone understood my point so I will mention it again. You could imagine the unstable jump node is position D, and a jump gated or stabalized one is position A. 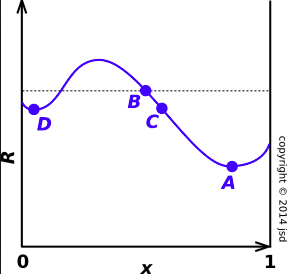 Assuming the R axis represents some energy level of the jump node, it costs far more to move the jump point from equilibrium A to equilibrium D than vice versa. You could make this as extreme as you like and apply it to jump points, such that its potentially viable to go around stabalizing every jump point you see, but it is in the very least extremely difficult to reverse the process, if not effectively impossible. I feel like this game tends to attract an above average of fairly intelligent people, are you all seriously saying that you can think of no conceivable reason a jump gate could be stabilized but not destabilized? Argue all we want from an in game perspective, I personally favor being able to destroy jump gates because anything that gives more choice to the player is a good thing in my view, but I think it's a bit disingenuous to argue absolutes about the realism of it when literally none of what we are talking about has any scientific basis at all. Maybe a good compromise is to have it as a setup option? "Allow deconstruction/destabilization of Jump Gates/Points" yes/no. If allowed any construction ship can reverse the process in same time it takes to get one in place. Currently I believe that jump gates (or stabilized jump points) should be permanent, for the reasons I listed earlier. The only way I would change that belief is if someone convinced me that an ability to remove jump gates would provide a 'game play' benefit. An argument for whether the unspecified stabilization process for a fictitious object can be reversed is going to have less influence on that decision. Personally, it's just a flavor thing. But one that I feel very strongly about BECAUSE it ruins my immersion in the game. I'd be totally fine with things as they are right now, IF they were just called "Stabilized Jump Points" instead of Jump Gates. I am irked by the idea of an indestructible space structure. Because every space structure should be destroyable, as is realistic. I have no problem instead with the idea of a stable jump point, one that has been stabilized and thus can be used by any ship even without a specific jump engine. I will almost certainly change the name for C#. I would have thought that having the ability to destabilise jump points would add quite a lot of flavour to the game. Given the improved pathing for merchants I’m expecting stabilised points to be more important to the economy for players and NPRs. At the moment you can leave invaders sat on a jump point and just turtle up as you know it’s hard for them to stay there (assuming playing with maintenance on). I would have thought the ability to destabilise jumps would force more challenges on splitting forces to defend multiple points or enable an attacker to more readily force an engagement (assuming the cost of re-stabilising the jump point is high enough or takes long enough to make it an issue). You could even have raiders purposely destabilize your opponent's jump points to break his jump point network. Like destroying the locks in a canal. You could have jump points destabilize on its own over time and revert to its previous state, while moving mass through it will add to its stability. The time it takes for it to completely destabilize could be 5 or 10 years, or variable. This way you will have to blockade the jump point and prevent ships from going through, if you want to close it down. Jump Gates are super convenient, no argument there. What I hate is finding ancient ones in an otherwise empty system - if they cannot be destroyed, then what happened to all those Precursor jump gates, few of which can still be found? That's a minor detail that has irked me over the years. If a JG is more of a stabilized worm hole, and the Precursors created them, should't literally every jump point in the galaxy have one. If they can despawn/destabilize/get destroyed, then why can't I do it? Or Invaders? If players can destroy/destabilize/despawn worm holes, what about the Invader inter-galactic one? Oh that's easy enough. They DO destabilize... with a half-life of roughly 146,000 years. Of being unused, since mass passing through causes restabilization. So to answer your question, yes they do 'despawn' the same way the sun 'despawns' but you don't see any tech for accelerating the process. If fact, if you really want to go that far, why do all jumpgates have to have an artificial origin? Couldn't some of them simply have natural origins? Like a jump point that via natural processes over its many many millenia of 'lifespan' has drifted randomly into a stable configuration and will in time drift out of it again. It would certainly explain some of the weird positionings of them (into dead end systems with no planets). Invader wormholes are something different entirely, they are completely artificial and require active energy expenditure to keep open. Based on Jump Points, to be sure, but with the conditions for their formation artificially generated (via unknown means) and tweaked to make them strictly one way (like jump points that are closed on one side). From a gameplay perspective, destabilizing wormholes do make sense in my opinion. If every jumpgate is an irreversable change to the galaxy, consider the situation of 2 large empires fighting. One side gets a decisive advantage, breaking the outer defences of the other, reaching its jumpgate network. In order to take advantage of this, it has to extend its own network until it touches the other's. Now the two empires are eternally locked into a jumpdriveless struggle until one side is victorious and the other dead. Even if peace is made some years down the line, there will always exist this highway from one's space to the other, with no way to break it or impede it. No clear border between the empires will ever exist again. Essentially, jumpgates ARE your projection of power. Connecting jumpgates to a system is a way of saying "this space is mine, I feel I can defend it from aggression". But there is no way to reverse that decision. Every war becomes all or nothing. You cant just capture territory, since you can't connect your own power projection to the system without opening your ENTIRE territory to massive counterinvasion. At the same time, the enemy cant allow you to keep his captured territory since it presents a foothold into the soft underbelly of his jumpbridge network. For Aurora as it is right now, that is actually fine. The game takes the form of fighting numerous AI opponents sequentially, since no AI opponent can give a human a challenge in the long term. But what about human v human games? Or multi-faction starts?